Imagine killing it at work and then going on vacation with your boyfriend, only to be told by a stranger online that you’re losing focus and you should go back to work. 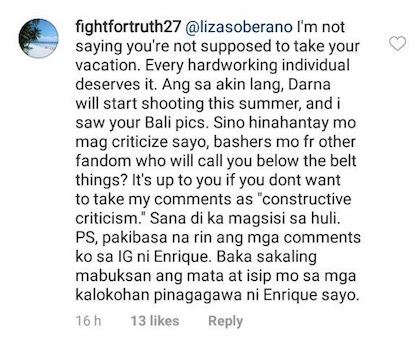 This is the comment that made Liza Soberano, who’s taking a break in between the smash hit Alone/Together and the much-awaited Darna remake, snap on Instagram. 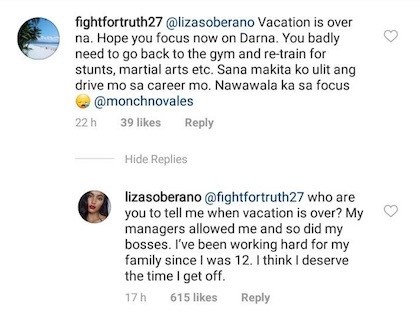 Replying to a netizen who said she “badly needed to go back to the gym” and focus on her career, Liza said, “Who are you to tell me when [my] vacation is over? My managers allowed me and so did my bosses. I’ve been working hard for my family since I was 12. I think I deserve the time I get off.” The actress is currently vacationing in Bali, Indonesia with boyfriend Enrique Gil and family members to celebrate his birthday.